So the lovely lady I’m going to be telling you about this week is a dear friend of mine. No seriously, I know her personally. She’s a bit chunky, has the breath of a dead animal a lot of the time, and snores really really badly. I can’t give anything else away, because I have to keep her identity protected, and this is all about her alter-ego. The adorable, the speedy, the amazing Le Bruiser. Le Bruiser, the most amazing French bulldog around! French bulldogs don’t often get to grace the pages of comic books, probably because they’re too busy sleeping. 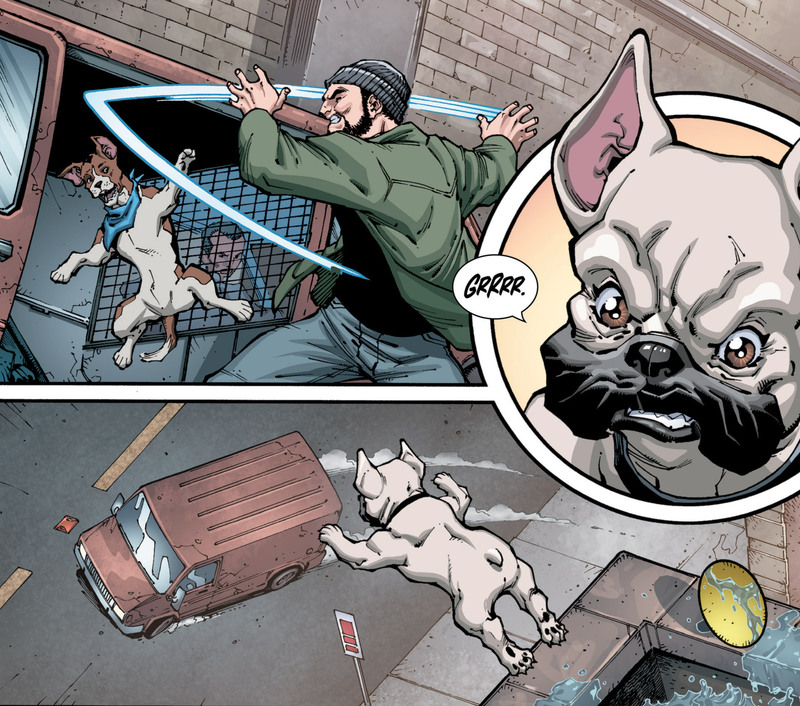 But this pooch is a superheroine, and a part of the Guardians of the Globe. 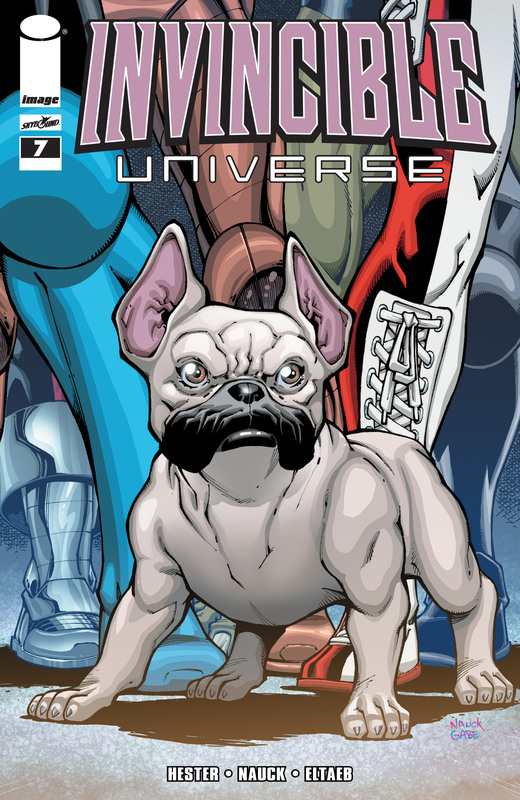 The Frenchie shines bright in her very own story, Invincible Universe #7, and it is seriously one of the best books out there. We start out with her looking longingly outside while the other members of her team have a meeting about bad guys, totes boring. Running around and chasing a frisbee would be so much better, of course. So she takes off outside and after running around a bit, looks down to see a man kidnapping a helpless dog. This just won’t sit well with Le Bruiser, and she uses her super puppy power nose to track down the scent. What she finds is one of the most horrible things created by man: a dog fighting ring. A few helpless dogs, including the one she sees getting kidnapped, cower in the corner while a truly disgusting human gives the signal to let his own fighting dogs eat them as a snack because they aren’t up to par to be trained. Just in time, Le Bruiser flies in-and this is the best part-rips the guy’s damn arm off! Yes! Finally justice!! The rest of the pieces of, um, excrement (I am so trying to be nice about these people here) flee, but nobody gets away from the might Le Bruiser. She takes out the rest of them and even faces off with Magnattack, a bad guy the rest of her team was conversing about in their morning meeting. Oh, and that dog that she saw get kidnapped? He comes home with her, and you can just smell love in the air as the two pooches yin yang out in sniffing each other’s cute little booties. Le Bruiser does have little appearances here and there throughout the series, but this particular book really shows how awesome she is. 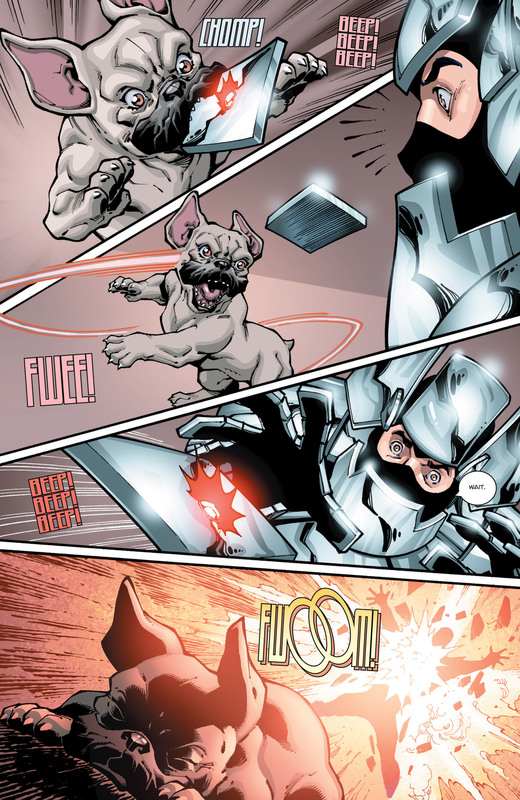 Written by Phil Hester, the story is as adorable as it is justifying, and Todd Nauck really captures this dynamic doggy’s personality. When people think comic book heroes, they often think of humans or other human-esque creatures. Though Le Bruiser does have super speed and heightened senses, she’s still a dog. Maybe our dogs at home don’t fly around and save the day in this manner, but dogs are amazing creatures that really are superheroes and superheroines in their own manner. Also the fact that the punishment for being a part of dog fighting is so light and there really aren’t any forms of fit justice for such a horrible thing, you can’t help but relish when Le Bruiser comes in and just tears that guy apart. Brutal? Yes. Fitting? Hell yes. I know this is getting a little personal, but if anyone is interested in what we can do to shut down dog fighting and help animals in need, check out these links. We can’t all be Le Bruiser, but we can still help. Le Bruiser is my favorite. Seriously. I want a Best Tiger/Le Bruiser team-up comic.